There’s that moment when you finally break the hermetically sealed bubble of air travel. When you leave the behind the air conditioning, the luxury brand advertising and the vagaries of airport security and customs and you get that first deep breath of real air. You blink into the sunshine and smell a new city through the tang of aviation fuel and the exhausts of waiting taxis. At first, it’s only a hint, a subtle something in the air that you don’t recognise. As you get carried into the city centre it gets stronger, a distinct note in the air which no two cities seem to share. London is old stone, river mud, stale beer and diesel. 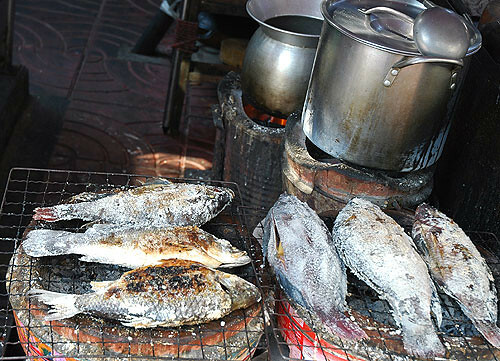 Bangkok is brown smog, sun baked concrete, incense, dried fish and cooking oil. We spend a great deal of time and energy trying to find authentic experiences when we travel. We don’t want tourist traps; we don’t like to think of ourselves as tourists at all. We are travellers, we’ll use out guide books to source the best and most authentic food and sights we can. In an in-flight magazine on my way here I was reading about one travel writer’s strategy for appearing like a local when travelling. It involved not consulting maps and getting lost a great deal all with a terribly studied nonchalance. I figured that a rotund Englishman with a Mediterranean background in a city full of Thais was going to stand out as much at that German guy in socks and sandals, bum bag and horrible shirt bellowing at everyone, so I just concentrated on getting something good to eat. Getting fed in Bangkok isn’t a problem. Walk in any particular direction for any length of time and you’ll stroll past food stalls selling anything from chilli spiked fruit, chicken satays and succulent pork belly on pillows of rice to strange kebabs of cut frankfurter, miniature pancakes filled with crème patissier and dried squid cooked over coals. 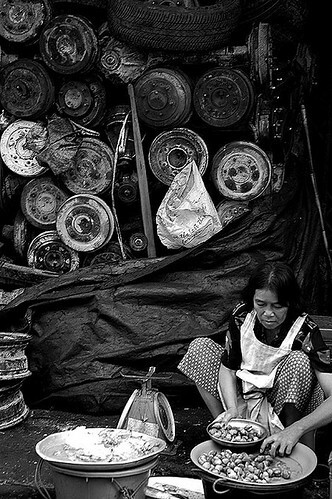 The streets hum to the sound of frying, bubbling and the crackle of coals. The problem isn’t getting fed. It’s deciding just what to eat for fear of turning a corner and seeing something else that looks good. Look down an alley and there’s probably something pretty special getting cooked up. Or more of those weird frankfurter kebabs. Having a strategy when confronted with this sort of choice is all important. I tried to use the same one that I adopt in Spain when confronted with streets and streets of bars and millions of pinxos to choose from. Watch what everyone else is eating at the busiest places and only eat that and then move on to the next avoid anywhere with a menu in English. It worked pretty well. Outside the Lumpini Thai Boxing Stadium I ate some of the best fried chicken I have ever eaten, deep crispy skin and sweet moist meat. I wolfed down roti to make your heart sing on a busy intersection whilst being hassled by tuk-tuk drivers, a stunning duck and rice amongst streets lined with engine parts sparks flying from a nearby welding torch. In the weekend market on cramped wooden tables, I ate stunning pork belly with mint and coriander, coke out of an ice filled plastic bag and hand cut pineapple on sticks. One morning a bag of small sweet grilled bananas for breakfast as I queued up with monks chatting into mobile phones to get on a river ferry. A gaggle of school girls practiced their English with me as I tried to choose which fillings to have in my miniature crepes, the girls recommending quails eggs and yet more frankfurters. A fierce little old lady manning a tiny hibachi like grill handed me about fifteen delicate and fragrant chicken satays after I’d asked for one and then made me sit down and eat them, the girlfriend then accusing me of eating twelve to her three. We dared each other to eat insects and both backed down. There were some failures too; both of us trying to spit out some foul Thai candied fruits without offending anyone and later subtly throwing away a couple of too sweet and strangely cheesy fruit drinks in a night market. One lunch time we sniffed at some satay that appeared to be made from processed meat, very much like small balls of chicken frankfurter dipped in sweet chilli and then pondering the wisdom of crispy catfish on top of a salad. 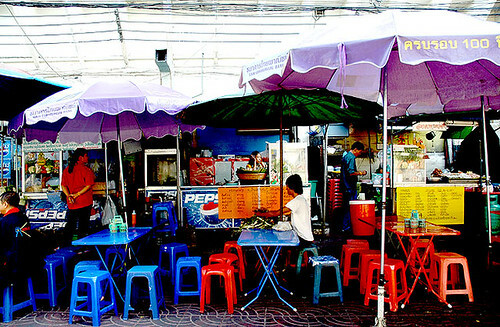 It needed a couple of more meals in a day to do any sort of justice to the simple, stunning food on the streets. Which actually turned out to be a good strategy and fits in neatly with the Thais themselves who traditionally eat smaller meals when hungry and not really at set times, just a constant topping up of sweet, salty and spicy to see them though the heat of the day. Well, that's my excuse. I hope this reaches you promptly - I wanted to seek your advice as am working on a food series for Channel 4 on healthy comfort food and thought you may provide some inspiration – you can reach me on 0207 434 6910 at anytime. I do hope you are able to spare a moment or two to chat.